Please switch the USB-Connection Mode in menu of Camera to 'PC-Remote'. PLEASE SWITCH OFF WIFI OF YOUR CAMERA ! Connect your cam with the android device. Please prevent the use of too long cables. Please connect the OTG-adapter directly to your Android powered device (do NOT connect OTG to camera !) and use an USB cable, fitting into your camera. If you are using free Version of RCCDroid, please switch Drivemode of Camera to Single Shooting (RCCDroidPro is able to work with all Drivemodes), because otherwise shutter will be locked. Please switch on your camera. There will be a popup, to choose the correct app . Please select RCCDroid or RCCDroidPro. We recommend to us RCCDroid/Pro as default app (pls. touch 'always' option). Please do not allow other Apps (e.g. Gallery) to connect to camera. In this case RCCDroid will finish with error message. If you did this mistakenly, you can remove access in Android adjustments for Apps. After a short initialization the graphical user interface will be visible. Please use the setting-option to maintain the Default folder where the taken pictures will be stored. In case of any connection problems please check FAQ site. The free version of RCCDroid is not able to handle rows of pictures. Please switch Drive Mode of camera to single shooting, otherwise Shot and Bulb buttons will be locked and there will be a warning sign in the Drive-M. field of the App. Please choose Preview Checkbox, if you want to see a preview of a taken picture. Focusing can be done via the AF-Button (State will be indicated with different colours). Start exposure with pushing the shot button. The taken picture will be stored in the choosen folder of the android device. Bulb pictures can be made, when camera is in Bulb-Mode. Goto settings and choose correct values for Timelaps or Bulb Intervalometer. Please go back to main menu of RCCDroid and touch the 'Drive M.' field. There will be a popup to choose the drive mode. I'm having an issue with my Samsung Galaxy Note 8.0 tablet. A connection is made, and I can take a photo from the app, but I can't get the app recognized as the one to view the pics, only the default tablet Gallery. Also, I'm not sure if I'm supposed to be able to change camera settings from the app, but I'm unable to do that or modify the stored photo location. Also, can't view RAW images. Is that possible? Please check our online manual. All qeustions are answered there. RCCDroid is not an app to view pictures. All taken pictures can viewed with other available app. Therefore it is not possible to make RCCDroid the default app for to view pics. Event for RAW files you need a special app (like RAWDROID), but all these apps can be find in Google App Store free of charge. 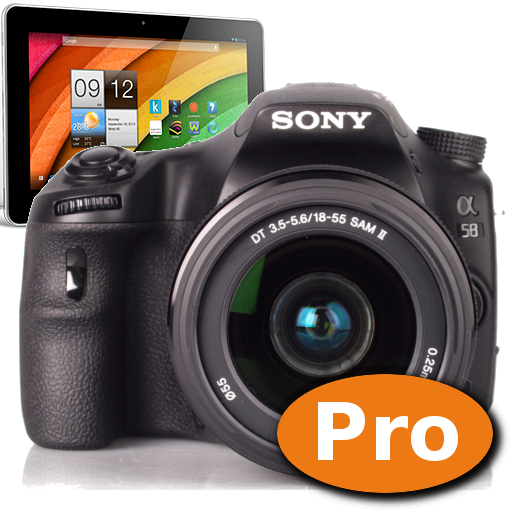 Change of camera settings can only be done with our Pro version RCCDroidPro. Can anyone pls tell me the settings required for star trail. I have A58 with pro version of the application. 1. Go to Settings and scroll down to Bulb Intervalometer. 2. Set the proper Interval in Seconds and if you prefer in minutes (This will be the time between pictures). As you are using a Sony A58, I don't recommend a short interval, because sometimes the A58 can be a bit slow while processing a picture, so set the interval above 15 sec (It depends in the time you wanna make the star trail. E.g: If you wanna make a 2 hr trail, you won't put an interval of 2 min between each picture because you would end up having just 30 pics), this won't be a problem as you are doing star trail, so 15 seconds are not a big interval. 3. The number of pics is...well, captain obvious. 4. Exposure time is the time you wanna leave the sensor recording, so it really depends on how bright is your night sky and your ISO/Aperture Settings. A standard settings are 30 Sec Exposure, f/4.0 and ISO 3200 but as i told you, it depends on your night sky. The rest of the settings leave them like that. Following instructions I get to where it says a popup occurs to choose correct app. But no popup shows. I am not sure if I have wifi off. Using A7ii and samsung galaxy tab s 10.2.
well, you should be sure to turn wifi off, otherwise the app will not work and there will be no popup. Hi, I use a Sony A77 mk II. I tried RCCDroid and I can only control the shutter, all other controls and settings seems disabled or unavailable. Is it normal? Is anything I can do to set exposure, shutter time and iso? Thanks! Please try the Pro Version of our app. It offers all options. So it is normal that the free version offer only the activation of the shutter. Bulb, exposure, speed and Iso are available only in the paid version. Exact? I just want to be sure that everything is normal before paying. Fantastic Application. Very much appreciated​. I was wondering, what is the use of Bluetooth feature available in the app? Please read the manual. If you like RCCDroid plesse let others know by a fair rating in Google Play Store. Is there a limit to how long the USB cable can be? 5 meters? There really isn't a way to prevent saving images to the phone and instead directly in the camera? If shooting RAW, would I be able to view them in the phone, since there are no native RAW image codecs in the phone? We do not know the limit, but another user was successful with 11m. There is no way to store pictures on the phone. There are apps in Play Store to view Sony RAW files. How to take the continues photo at regular interval. By using this app. Pro Version is needed. Please read the manual. What additional features does the Pro version have for my a700?